Description Ayodhya is considered to be one of the 7 Muktistalams of India. Ayodhya is believed to be a component of Vaikuntham, given to Manu by Vishnu, and installed on the banks of the Sarayu. Ayodhya is very closely associated with the story of Rama (as told in the timeless Indian epic Ramayana). Ayodhya is located in Uttar Pradesh and is visited by thousands of pilgrims throughout the year. 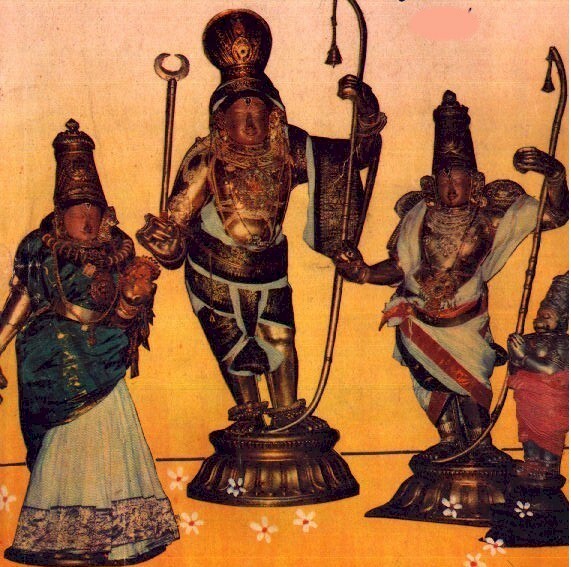 The Tamil Alwars have mentioned Ayodhya in their works ; Nammalwar, Tirumangaialwar and Tondaradippodialwar in one poem each; while Periyalwar and Kulasekharalwar have six and four poems each, mentioning Ayodhya. The Ramayana dates way back in time. The Alwars lived in the latter half of the first millenium CE. The Ammaji Temple is a temple built embracing South Indian architecture, at a much later date, at Ayodhya, on the banks of the Sarayu river. Ranganathar and Rama are enshrined here. Rama is enshrined in a seated posture facing North. Worship services are conducted here by South Indian Sree Vaishnava priests. There are several temples and shrines related to Rama Sita Lakshmana and Hanuman in the ancient town of Ayodhya.